"A straightforward approach to the simple art of coaching conversations, while offering insight into the complexity and sophistication of coaching for those looking to take their practice to the next level." Dr Jonathan Passmore Coaching Skills is much more than just a book containing a wide portfolio of tools, techniques and concepts, brilliantly supported by many case studies. It is a book for practitioners who will find here a profound and accessibly-presented analysis of the most important models, theories and results of research, with detailed links to coaching as well as guidelines on how to deal with the difficult situations and dilemmas faced by coaches. Dorota Porazka, Managing Partner of DORADCA Consultants Ltd "Jenny Rogers writes with enviable elegance and simplicity about the skills that coaches need. This third edition is a testament to her belief that coaches never stop learning. In this edition she shares the fruits of her recent reading and experiences. There is a good deal of new material, including a chapter on advances in neuroscience, new insights from the recent coaching literature and new models to consider. But Jenny wears her erudition lightly. She takes the reader by the hand through a complex journey, sharing the excitement of her discoveries but not overwhelming with detail. Her strong personal voice comes through in every sentence, understanding, encouraging, pragmatic. I read it from cover to cover in a weekend, and know I will be back to reread before long." Lis Paice, NHS Mentor of the Year, 2010 "Jenny Roger''s clear writing style, straight-forward approach and case examples allow for insight into the coaching process and a glimpse at the learning that occurs for both client and coach. This edition offers even more with enhancements to previous writing and a chapter specifically focused on the brain. Whether you are a coach - new or experienced, a manager or simply interested in learning more about what we do as coaches, this is a must have resource for your library." Diane Brennan, MBA, MCC, Past President of The International Coach Federation (2008) and coeditor, The handbook of knowledge-based coaching: From theory to practice "This book is a gem for anyone curious about executive coaching - what it is, how it works and how to do it well in practice. As a coaching pioneer and highly accomplished practitioner, Jenny draws upon her extensive experience in coaching, coach training and supervision and brings to life theory and approaches with rich case studies, humour and humility. The third edition benefits from a chapter on the fascinating emerging field of neuroscience and explores early implications for coaching. As with the rest of the book it is accessible, relevant and well researched. 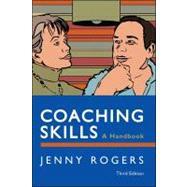 I consider "Coaching Skills" to be essential reading for novice and established coaches alike." Sandra Grealy, Director of Coaching, Management Futures Ltd Among all the coaching books on the market this book stands out for its clarity and wisdom, and for its engaging and unpretentious voice. In designing a coaching course at Fielding Graduate University, I had no hesitation in making it required reading." Leni Wildflower, PhD, PCC, wildflower-consulting.com Substantially updated throughout, the latest edition has new material on coaching and the human brain, working with clients on their self-limiting beliefs, new models of understanding what coaching is and being a coach during the psychological stresses of a severe economic recession. Coaching Skillsis a popular text for coach training schools all over the world, brought to life with dozens of case studies and practical guidance, while also emphasizing the importance of underpinning psychological awareness and understanding. This book will support you whether you are an experienced coach working with senior executives, or a beginner taking your first steps on the journey to becoming a master-practitioner. The book answers questions such as: Are there really boundaries between coaching, therapy and training, or is it all more fluid than many people acknowledge? Which tools and techniques pay dividends every time and which should you avoid? What are the magic ingredients that determine whether the coach-client relationship works? Why are goal-setting and questioning such important skills for any coach and how can you acquire them? How as a coach can you work with clients to make truly transformational changes in their lives?